Haystack is a search engine system that puts a premium on privacy. It helps you track and find your files regardless of their local or cloud location so you can finish faster. Despite that, it does not store copies or information regarding your data on its servers, thus allowing you to keep your privacy. With Haystack, you do not have to wait long for search results to appear. Because its search engine is integrated directly with your computer, it can provide you with results instantly. On top of that, it ensures that your data is not compromised in the process. For now, Haystack has more than 28 integrations. This number grows every week so you can look forward to pulling information from more applications in the future. 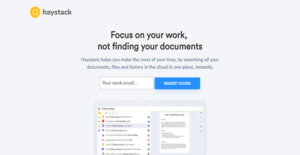 Haystack is built into your computer to pull the files and documents you need instantly. Apart from that, it can also search in your cloud storage systems, email clients, CRM, browsers, and other applications. Because of this, you can find the data that you need regardless of their location. Because it is integrated tightly with your local and external drives as well as with your favorite tools and software, Haystack can find your files immediately. Therefore, there is no need for a loading bar that you have to check for how long until you get your search results. Opening different files to check if they are the ones you need is time-consuming. To prevent that process, Haystack provides you with a built-in file preview. This way, you can get a close look into the file or document without opening it. With Haystack, you can even find a website page that has the term that you are looking for. That is because it can read your browser history. What makes this different is it conducts a full-text search rather than the regular browser search, which only scans webpages’ titles. Although Haystack can read your local and cloud data, it does not mean that it is infringing on your privacy. Its search engine is merely built into your system—in no way does it store your information in its servers. What Problems Will Haystack Solve? When you search on platforms like Google Drive, Slack, or a browser, you spend upwards to 70 seconds trying to find your document. Haystack cuts down that waiting time by giving you helpful shortcuts that let you search across different accounts immediately. The solution even lets you preview the files before opening or downloading them. As a result, it takes less than 10 seconds to complete your search. If you had a blog or blog post that you enjoyed but could not remember, you may have to spend several seconds or even minutes to find it in your browser history. Since regular browsers only read webpages’ titles, there is a chance you might never find it. The case is different with Haystack because of its full-text search capability. It finds your favorite site or article even if it has to work with a common term or phrase. When you are working on a project, it is likely that you work with three to five tools at once. These results in heavy memory load because you need to keep multiple tabs or windows open at the same time. Haystack resolves this by letting you create Collections, where you can store websites and documents for easier access. You can launch them with a specific shortcut and even search through them, too. There are popular and widely used systems in each software group. But are they necessarily the best fit for your organization’s special requirements? A popular software solution may have thousands of customers, but does it offer what you need? For this reason, do not blindly invest in popular systems. Read at least a few Haystack reviews and mull over the aspects that you desire in the software such as the price, main tools, available integrations etc. Then, choose a few systems that fit your wants. Try out the free trials of these products, read online comments, get information from the maker, and do your research thoroughly. This profound research is sure to aid you select the finest software platform for your organization’s special requirements. How Much Does Haystack Cost? We realize that when you make a decision to buy Productivity Suite Software it’s important not only to see how experts evaluate it in their reviews, but also to find out if the real people and companies that buy it are actually satisfied with the product. That’s why we’ve created our behavior-based Customer Satisfaction Algorithm™ that gathers customer reviews, comments and Haystack reviews across a wide range of social media sites. The data is then presented in an easy to digest form showing how many people had positive and negative experience with Haystack. With that information at hand you should be equipped to make an informed buying decision that you won’t regret. What are Haystack pricing details? What integrations are available for Haystack? If you need more information about Haystack or you simply have a question let us know what you need and we’ll forward your request directly to the vendor.